So much of life is hassle, but then again so much of that hassle is life. To live carefree doesn't mean a lack of hassle; it is a lack of perceived hassle. Where do we stand but in our own minds considering our to-do lists, taking hesitant steps towards our futures with our pasts reluctantly shrinking behind? It is all there. And this is the mire of a life too-considered, thought of too-deeply, where merely the weight of reality is unshakeable and burdensome. So, yeah. Music is medicine for the human condition. Music is distraction. Music sounds good. No matter what type you like. Sing-alongs, cry-alongs, dance-alongs - whatever. It's all important. Sorry about that. Don't mind me. I've just been thinking too much. Luckily I've been doing it whilst I've been listening to music so it's kinda like it could've all happened in a dream or something. And right now I'm sitting on a very housey cloud (no I'm not "on drugs", I just have an imagination) and its the glorious repetition of this kind of music that is good for p much hypnotising you and calming you down. In a different scenario though, like at night in a club, that repetition serves the same purpose - inducing a trance-like state - but fits the situation, making you dance like crazy and not calming but creating euphoria. What's been doing this to me, you ask? 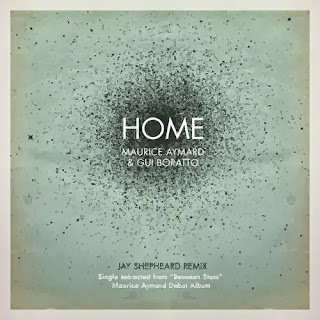 Why, it's 'Home' by Maurice Aymard & Gui Boratto (whom I wrote about in August). This is the lead single from Maurice Aymard's forthcoming debut album, Between Stars (on Aymard's own label, Galaktika), which is gonna be - if this song is anything to go by - a cool collection of Latin-spiced house tunes. 'Home' is a great collaboration between Venezualan Barcelona-based Aymard and Brazil's Boratto, who flew to Barcelona and went "straight from the airport to Aymard's studio for an intense 24-hour session". What I noticed first is that, despite being house/dance music, everything here sounds completely organic, home-grown; there are real instrument sounds here ranging from shakers and bongo drums to bass guitar (complete with actual plucking sound and fingers moving along the strings) and drums in general: cymbals lightly crashing and understated hi-hat shuffle. An organ with liquid chorus plays out some delicious jazzy chords which evoke watching the manic pace cities at night with tired eyes. The bassline is dripping with groove. Synth sounds join the party (or what could be a guitar) with a really nice tremolo melody, twinned with delayed lead synth that sends retro shudders through the whole thing and high-pitched strings help give that urban sense of drama. And if that wasn't enough for you, the single includes a remix of the song by Berlin-based English producer & DJ, Jay Shepheard. He gives it a more electronic twist, turning into something closer to a club track, whilst retaining and somewhat enhancing, with beefed up string section especially, that dramatic nocturnal feel that the original exuded. He takes some of the original tremolo melodies and stretches them out with major delay. Jazzy piano chords are interspersed throughout alongside a female vocal sample. The bass is now synthetic, with an 80s-style 'wah' to it; staccato synth chords also rapid-fire across the board in the second half of the track. Dreamy soft synth and strings lead us out to a medley of percussion. Please, if you enjoyed this, keep an ear out for more from Mr Aymard to come.